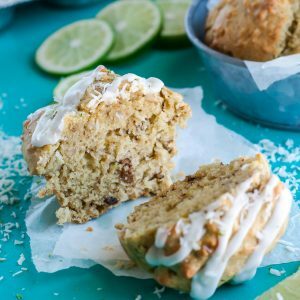 These small-batch Coconut-Lime Avocado Muffins are fluffy and flavorful! Recipe yields 6 large muffins. Combine powdered sugar with 1 tsp each of lime juice and coconut milk though any dairy or dairy-free milk will work! and beat together using a hand-mixer or a whisk and some serious muscle power! Add extra juice/milk as needed to reach desired thickness and mix in as much or as little lime zest as your heart desires! for funsies: mix a handful of freshly pureed spinach leaves into the batter for even greener muffins! Lightly grease your favorite standard-sized muffin tin with coconut oil. Add lime juice to milk and set aside [it makes a yummy faux buttermilk!] Set aside all cold ingredients to reach room temperature. In a medium bowl, combine flour, baking powder, baking soda, salt, cinnamon, and nutmeg and grate one teaspoon of lime zest into the bowl. Set aside. In a large bowl, combine avocado and softened butter with sugar and, using a hand mixer, whip until fluffy. Add vanilla, milk and lime juice and mix. Lastly, add the eggs and wisk until just incorporated. Sift the dry ingredients into the wet ones [sifting adds to the fluff factor] and fork-mix just until the batter thickens. Fold in the walnuts and coconut and over-stuff your muffin tin to yield 6 muffins with some serious muffin top! Grab a baking sheet, place your muffin tin atop it and plop it in the oven. Immediately turn the heat down to 375 and bake for 18-20 minutes, until a toothpick comes out clean from the center. Nutrition Facts below are estimated for muffins only using an online recipe nutrition calculator. Adjust as needed if icing is added and enjoy!